My 8th grader is making his breakfast while reciting, nearly word-for-word, an episode from one of his favorite shows and laughing hysterically. I can barely understand him. I nod and smile and make approving noises but I miss even the intelligible words. I know, bad mommy moment… but it’s 7:46 AM which means I have 14 minutes to make his lunch, shower, do something really important I can’t remember, and gather my stuff because today is my out-of-the-home-office writing day – no excuses – no diversions – and unless someone is bleeding out, “Focus” is my middle name. Period. Adding to the angst is “The Tardy Letter” we received last week. One more tardy and we BOTH end up in the principal’s office! Neither of us understands how this happened, unless it’s that lingering case of I-forgot-something-itis. We sprint out of the house, scramble into the car, and catapult ourselves through the drop-off lane just before the gates close. At least we didn’t screech to a halt… much. Students are already crowded at classroom doors, pushing each other and causing last-minute mayhem. My son races off, rolling backpack trailing wildly behind. Just before rounding the corner, he looks back to give me a “thumbs up” paired with a maniacal smile. I love this kid! As the gate closes behind me (yes, I’m the last car), I drive off to Peet’s Coffee where I find the place teaming with conversationalists. Today the din is perfect for writing: the tone is balanced and includes a touch of intensity topped off with joyful over-notes. 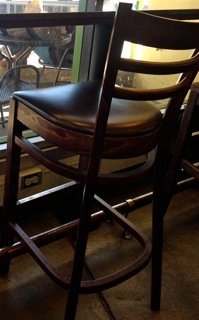 I luck into the last seat at the writing bar – a long, high counter perfect for laptoppers – and realize the climb onto the bar-stool chair isn’t as awkward as usual (i.e., no one is injured). My feet dangle like a kid’s as I ponder this important point: Why don’t these chairs swivel? Seriously. Picture a writer all frozen and tense, caught in a moment of writer’s block, when suddenly (and without warning) she pushes off into a wild swivel ? It could totally break apart that inertia, if you ask me. After a time, I notice there are four of us huddled over computers: two are furiously writing, one stares out the window with the gleam of inspiration in his eye, and one is catching snippets of other people’s conversations because she is in a state of inertia and sitting atop a non-swiveling bar-stool chair. Well…. why don’t we just pause for a Peet’s Moment, shall we? I don’t make a mental note to forget his info because I’ve already forgotten his first name – but let’s call him Bob. What my memory does latch onto, however, is that Bob will be living in a place with the word “bear” in it’s title. How exotic… and a tad unsettling – especially if you believe in the Law of Attraction (i.e., what you feel/think is what you attract to you). My vicarious fears aside, I notice Bob has been on hold with his auto insurance company for quite some time now (I SO need a swivel chair). When he finally gets someone on the line, Bob does the unthinkable: He asks them to hold. Then, get this, he sets the phone down and blows his nose. My ears grow wide with awe and wonder! What a bold guy that Bob is. I would have let my nose drip to distraction before taking a huge risk like that. But, then, that’s why Bob is moving to Big Bear City and I am not. He obviously has a whole new take on this Law of Attraction thing. Okay, thanks for waiting. Just added some non-whining content to my journal, wrote out an idea for a class I’m teaching, and even created a semi-balanced work/life plan for the day which includes “quality listening” to one middle school student. Odd time for inspiration – I thought distraction was an evil byproduct of inertia when, actually, it seemed to help. Of course, I’m still holding out for a swiveling bar-stool chair. Perhaps they make folding ones for easy transport…. I’ll ask Bob. Sweet, BJ! I love the playfulness of this post. It’s such a treat to read your writing. Keep it coming. Thx Gail!! Glad you enjoyed it! Just dropped by – I love this post. It’s so real and entertaining and I love how you NOTICE everything! I am sitting on my non-swivel office stool right now with my legs all bunched up into a cabinet – wish I was non-swiveling in PEETS with you!